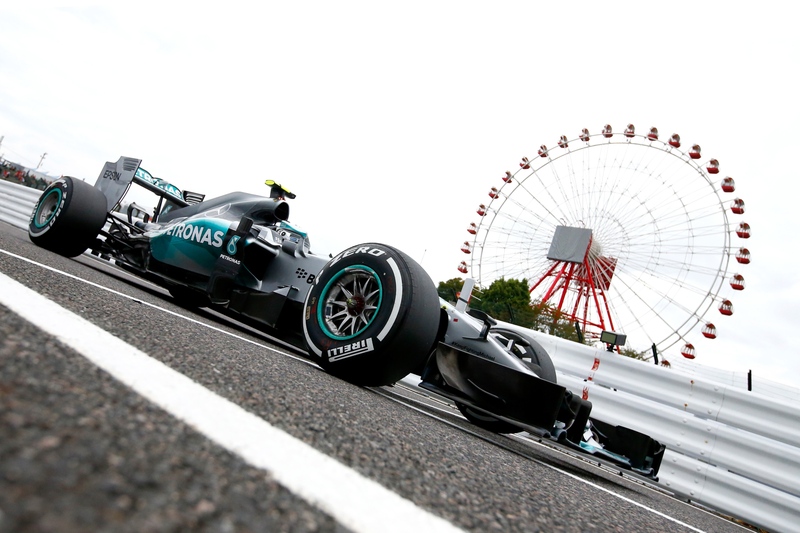 Nico Rosberg has taken pole position for the 2015 Japanese Grand Prix at Suzuka. The Mercedes driver beat his team-mate Lewis Hamilton; with the pair returning to the front row of the grid after a dismal weekend last time out in Singapore. Hamilton may have been able to beat his team-mate had it not been for Kvyat’s crash in the final session, which saw the Russian roll his car at the hairpin; bringing out the red flag and ending the session before anyone could put another lap in. Rosberg’s pole position is only his 2nd this year and it is only the 2nd time that he has beaten Hamilton this year. It also means that Lewis Hamilton’s run of never getting pole position at Suzuka continues on for another year. The pair had been close throughout the session, with Hamilton fastest in Q1 before Rosberg took over in Q2. The pair ended qualifying just 7 hundredths of a second apart. 3rd on the grid at Suzuka for the 2nd year in a row was Valtteri Bottas for Williams. The Finnish driver and team-mate Felipe Massa were almost exactly the same pace as the Ferrari’s of Kimi Raikkonen and Sebastian Vettel, but a last session mistake by Massa opened the door for Vettel to take 4th; with Massa 5th ahead of Raikkonen in 6th. Kimi was also disappointing in the final session after having been faster than Vettel throughout the day. 7th on the grid will be Daniel Ricciardo, who didn’t seem to be able to replicate Red Bull’s good pace in Singapore on the Suzuka circuit. 8th fastest was Romain Grosjean for Lotus, with Sergio Perez just behind in 9th. 10 place in Q3 had belonged to Daniil Kvyat, but the Russian driver will start last after a massive crash in the final moments of the session. Daniil dipped a wheel onto the grass at the right hand kink before the hairpin, which sent his car side-ways into the barrier at high speed. The impact pitched his car into a roll, writing off the chassis and heavily damaging most of the Red Bull. Kvyat walked away from the crash and admitted later that it was a rookie error. Due to his chassis change he will start last, with Carlos Sainz promoted up to 10th. Sainz’s team-mate Max Verstappen didn’t get into the top 10 shoot-out at the track where he made his F1 practice debut last year. The Dutchman suffered an electrical failure in the first session, forcing him to park the car on the exit of the hairpin. Furthermore, he was penalized 3 grid positions for failing to get his car off of the racing line. Jenson Button failed to join his team-mate Fernando Alonso in the second session after being caught out by the stranded Max Verstappen. He will start 14th at Honda’s home race, with Alonso 12th.